The buzz is starting to build over the upcoming convention of the National Railway Historical Society, which will be held in Tacoma, Washington, in late July. The last time there was an NRHS Convention in the Pacific Northwest was in 2005, based out of Portland, Oregon. The star attraction in Tacoma, as it was in Portland, will be Southern Pacific "Daylight" 4-8-4 No. 4449. Prior to the Tacoma convention, No. 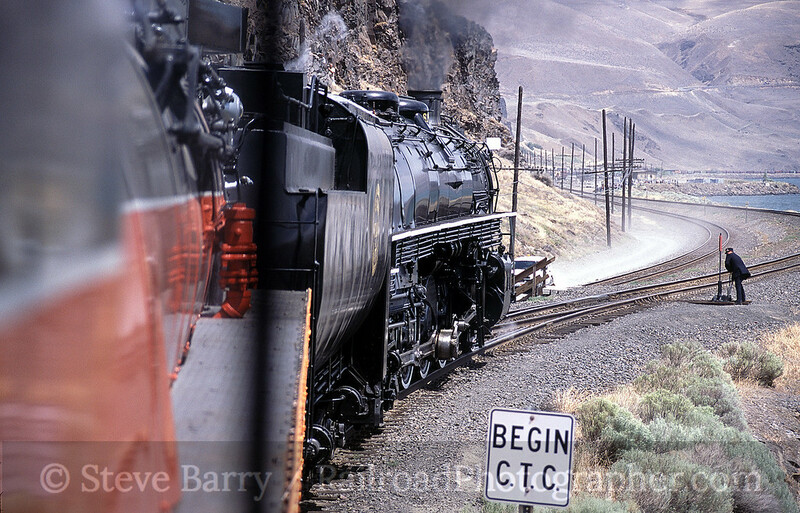 4449 will be powering a trip from its home city of Portland along the Columbia River to Wishram, Washington -- this route was featured at the 2005 Convention and is the subject of today's story. The date was July 6, 2005. I had put together the night photo session for the Portland Convention and the Convention committee had offered me a parlor car ticket for the ride to Wishram for helping them out. I decided that a relaxing day riding a parlor car would be a nice alternative to chasing the train for once, and decided to do that. 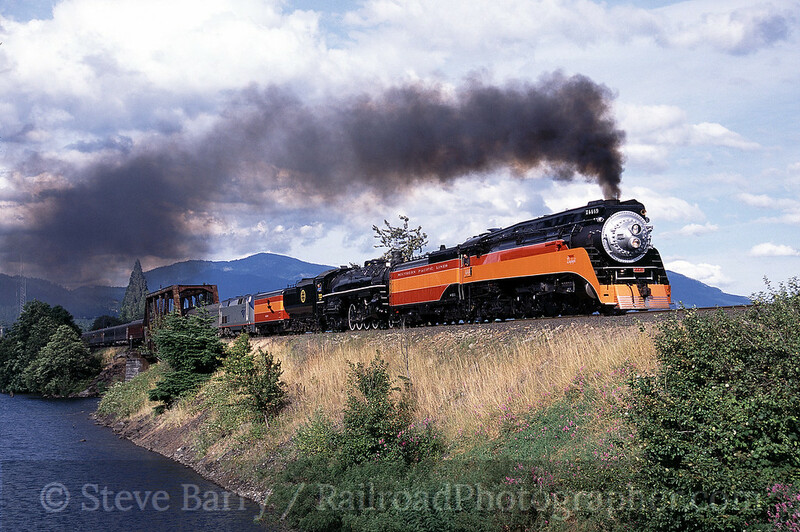 That is, until it was announced that the 4449 would be sharing the head-end duties with Spokane, Portland & Seattle No. 700 and the 700 would be leading the eastbound trip. The route along the Columbia is ex-SP&S and it has long been my goal to get the 700 on its old home rails popping out of the classic tunnel at Cape Horn. So, I gave away my parlor car seat and drove to Cape Horn to get a shot I had long yearned for. The day was misty, not uncommon for the west end of the Columbia River Gorge. Nonetheless, 700 made a fine sight as it emerged from the rocky tunnel (above). Knowing that I had a long walk out of Cape Horn and the highway would be clogged with chasers, I decided to meander towards Wishram; if I caught the train that would be fine -- but if I didn't, that would be okay, too. 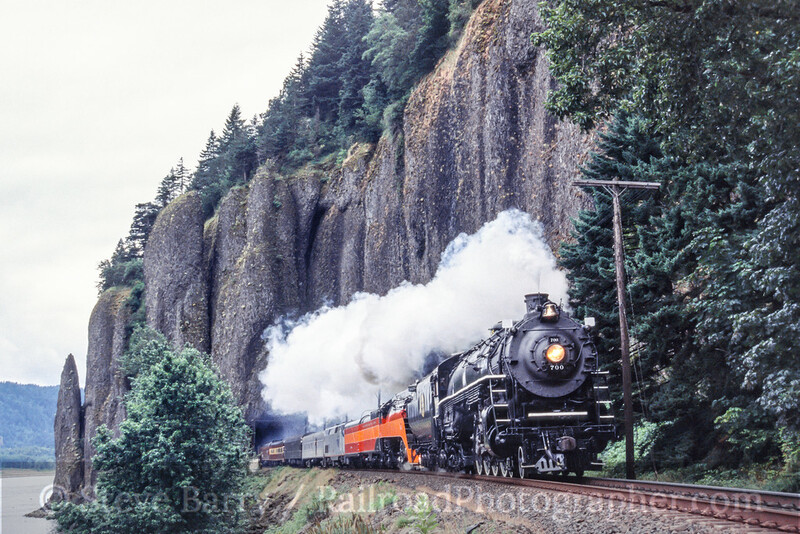 I crossed from Washington into Oregon to take advantage of the interstate highway on the south side of the river, and as I neared The Dalles, Oregon, I caught and overtook the train. Suddenly I was in "chase mode" and cranked up the speed on the car -- I needed to get across the river to get a shot of the train from the highway bridge. As I crossed the Columbia I could see the train down river rapidly closing in. Fortunately, there is a large gravel parking area at the north end of the bridge, and I was able to park in a cloud of dust, grab the camera and run back onto the bridge and get the shot. Whew! At Wishram I went over to the 4449 and was immediately invited into the cab by engineer Doyle McCormack. As it turned out, about that same time the train was given permission to back out of Wishram to be turned for the return trip, so I got a short cab ride in the process. For the return trip I decided to roll the dice and follow the route back on Washington Highway 14, a twisting two-lane road. I knew if the train went as fast back west as it did coming east I probably would only get one shot. Still, I figured it was worth a try. As it turned out, the passenger train had many meets, including at Stevenson where I got a nice shot with the 4449 in the lead. All in all the day couldn't have gone much better. I look forward to getting back out to Washington and seeing the 4449 again. I won't be able to chase the Columbia Gorge trips in early July, but the Stampede Pass trip should be a fun chase.